Allegro’s RomXML AE Parsing and Framing Toolkit drastically decreases the time and effort needed to implement eXtensible Markup Language (XML) in your embedded application. XML offers a processor-independent method to encode data for interchange between diverse systems and is based on a set of rules for the construction of tag-delimited information. When designing embedded systems, it is useful to leverage standards-based technology to exchange data between your embedded device and general purpose computing desktops or workstations. Whether you are engaged in developing a unique man-machine interface or a sophisticated machine-machine interface, a standard interchange format such as XML simplifies and reduces your development efforts. However, implementing a general-purpose XML parser will likely prove to be impractical. For typical embedded applications, the tag set or schema does not change. The primary need for an embedded XML Parser or Framer is to efficiently translate data between XML syntax and internal storage (typically a C structure). The Allegro RomXML AE Parsing and Framing toolkit provides a lightweight translation between pre-defined C-language structures and XML-based representations. 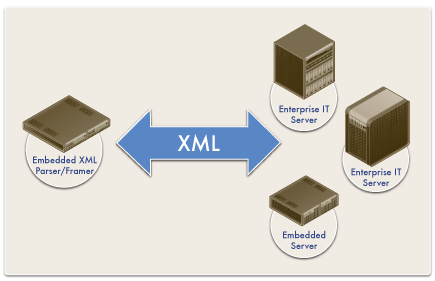 Within enterprise environments, there are two common methods employed for dealing with XML. One approach is a method called Simple API for XML (SAX). In the SAX approach, as a document is parsed, XML elements and attributes are passed to a user program for interpretation. The XML information and underlying structure are discarded in this parsing method once the data is passed to the user program. While this method doesn’t use much memory, it requires the user program to deal with XML in a sequential manner rather than as a whole entity. Since the XML syntax and underlying structure are discarded, SAX style parsers do not provide much support for the framing process. The Second approach typically utilized in an enterprise environment is a method called the Document Object Model (DOM). A DOM parser recognizes that an XML document is a hierarchical data format and stores a tree structure representing both the underlying XML information and data. An API is provided to traverse the tree structure in any order and allows access to the entire XML document. Framing a new document is very straightforward since the XML data and overall structure is retained. However, the DOM method for parsing and framing documents is very memory intensive often utilizing over twice the memory of the original document. The RomXML toolkit is designed for embedded devices that have limited resources and wish to use a more powerful method than SAX, without the overhead of DOM. For embedded applications, devices do not need the ability to parse and frame general-purpose XML documents. However, embedded devices do require the ability to efficiently translate device specific data between an internal format (such as a C structure) and XML syntax. This means the schema (XML element definitions) for a given document does not change and can be specified at compile time. The RomXML AE toolkit provides a lightweight translation between pre-defined C-Language structures and XML formatted representations. This enables an embedded device to exchange data as well-formed XML documents without the overhead of general-purpose XML translators. As part of the RomXML AE toolkit, the TagBuilder compiler further decreases your development effort when utilizing XML in your embedded design. RomXML AE uses a special set of tags (RxSchema) to define an XML object. The RxSchema language allows an XML object to be defined with both C-language internal storage format and the set of XML elements and attributes used with XML-based data exchange. 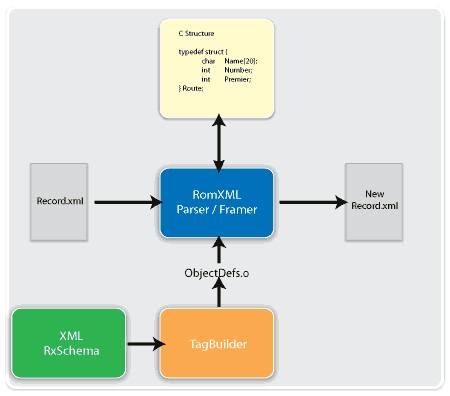 The TagBuilder compiler analyzes the RomXML AE RxSchema object definitions and produces an object definition file in a C-language source that is compiled with the RomXML AE Parser and Framer code. The definition file contains the transfer tables that the runtime RomXML code utilizes to perform specific translations. The RomXML AE runtime is delivered in ANSI-C, is highly portable and offers a rich API for your development team to handle XML objects. RomXML AE can handle XML datastreams transmitted with your proprietary communications methodologies or in connection with Allegro’s Secure IoT Suite of products. When used together with the rich Allegro AE suite, web services such as SOAP and XML-RPC are also available for use in your design.